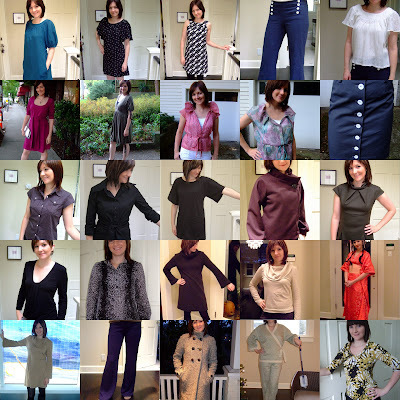 I followed Erica's example and have assembled a collage of my completed garments since I started this blog in March 2007. Looking at it this way helps me to forget the pain of all the ripped seams. I hope to get even more done in 2008. Girl, you have sewn some great things this year. I can't wait to see what's in store for 2008! 2007 was a GREAT sewing year for you! Happy New Year! Great collage, you have completed a lot of nice things. You were busy this year! Happy New Year & I look forward to seeing what you sew in '08! A couple of years ago, I tried tracking how many yards I sewed up - I gave up 3/4 of the way through since I stared making so many 'small' projects that didn't require much yardage. I wish I would have stuck with it - maybe I'll try again this year! Happy New Year. I love the collage of finished garments. You have had a very productive 9 months! Happy new year! Great collage of a lot of great sewing accomplishments! You have been very productive and it was great to see all the garments all together! In tracking your fabric sewn, are you going to place the numbers on your blog ala Shannon (Hungry Zombie Couture)? And how will you handle tracking them? The questions are because I want to do the same thing...track yardage used...but haven't figured out a way yet! You've been really productive! Happy New Year! 2007 was a great year for you, sewing wise! Look at all you've achieved! Great job! Happy New Year!! Yards in and out is the only resolution I have - at least that's public. I have seen people do this on a spreadsheet, but like you, I have a pretty book I am planning to use for a sewing notebook. I love your collage. What did you use to make it?